Some women are petite, some want other elements of a piece to shine, and some feel that a leap to mega-millimeter size is just too much. When Christine bought this 2mm pearl-sprinkled garland, I agreed instantly that it was perfect. Yes, there is a place for petite pearls. 1. Used as multi-strand necklaces. 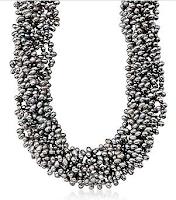 Ross Simons sell a seven-strand 4.0-4.5mm grey pearl torsade with a silver hook clasp; price, $95 for 16, 18 or 20 inches. With a shirt and pair of jeans you have a striking pearl accessory for likely less than the price of your pants. 2. Used in a piece of delicacy and discreet charm. There is no lovelier example than BeladoraII's freshwater pearl and diamond lariat, with tiny pearls threading through a white gold and diamond circle. Price $495–and I could not imagine a more rafinée accent for a neck. Hello, modern-jewelry lovers! 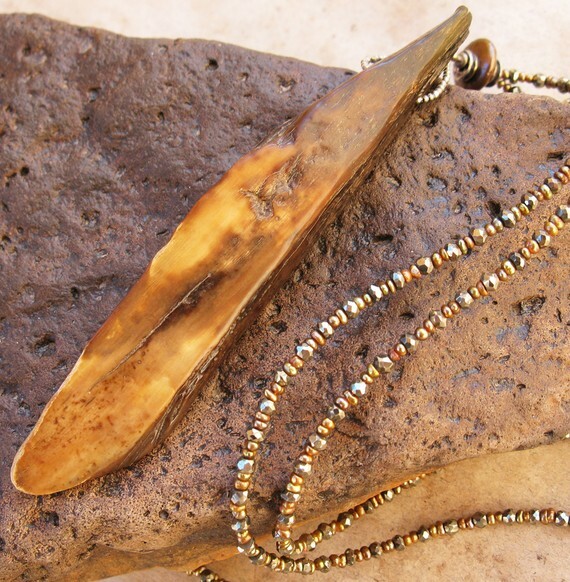 A fossilized ivory shard hanging on a 'chain' of bronze seed and button pearls is fine, yet earthy. The price is $227 from etsy seller deserttalismans. 3. When small pearls suit you. Petite, slim, fine-boned women can carry delicate pearls (but can also stun in a substantial strand of Tahitians). One of my summer visitors was such a woman, and it is she I thought of when I found the piece below. 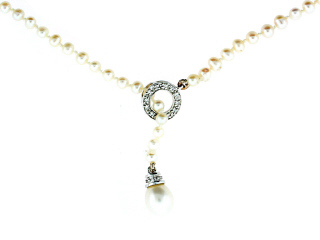 This 2mm white freshwater pearl necklace is delicacy pearl-sonified; a petite woman will twist this around her long neck and look sublime. She might also layer it; the 22k toggle closure elevates the pearlettes from ordinary to elegant. Made by Cathy Waterman. Length, 32 inches; price, $988 from Twist. Caveat: A strand too small is no strand at all. If buying a classic round strand, size does count. So that you can judge for yourself, here is a series of photos from American Pearl. The first shows small, 5.5-6mm pearls. See how girlish and lost those pearls look? And the model is young. I have ideas for remodeling a strand like this here. Let's move up to 7.5mm-8mm. This is the minimum size for a woman who no longer wants "jeune fille" jewelry, regardless of her size or shape. And now to the 9.5mm-10mm., my preferred size, but then, I am tall and large. They are admittedly more costly, but you can wear the right size forever; too-small is a false economy. Every 2mm adds a doubling effect to the visual sense of size. You'll see more glow, more of the mysterious essence of the pearl with each 2mm jump; even a 1.5 mm increase will look much bigger. Petite pearls flirt, big pearls seduce. In-between pearls are nostalgic souvenirs that beg for restyling, and will then delight you all over again. One of my favourite ways to restyle a necklace: convert to a bracelet. 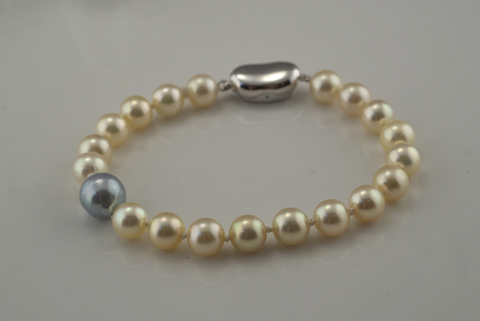 Shown, a bracelet from Kojima Company, of 7mm akoyas (often the size and type of the "wedding dress necklace"), styled with one blue 9mm pearl and a modern 'bean' clasp. Price, $270. 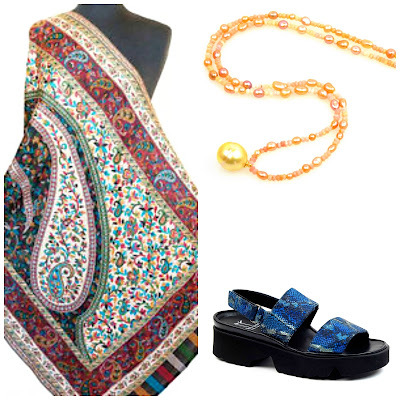 Why not retain the sentiment, wear the pearls and have a new piece, all for a modest investment? I have an inherited double strand bracelet of 5-6mm's that now feels just to straight-laced for my style. I really need to explore some options for reworking it. LOVE that "desert talisman" necklace! Love the Cathy Waterman piece, as she is easily my favorite designer. I treated myself to a pair of 8.5mm earrings for my birthday and now rarely wear anything else. However, I don't wear them with my antique strand of 9mm pearls, too matchy, and the strand is so heavy, I wind up with a sore neck by the end of the day. I wouldn't ever go smaller, though. Shorter strand, yes, but that's the beauty of pearls. One never can have enough (Queen Mary is my fantasy role model there!). I wear my short 6mm strand with larger baroque strands as I agree about them being too girlish. I never tire of these pearl posts! You find the most tempting pieces to share with us. 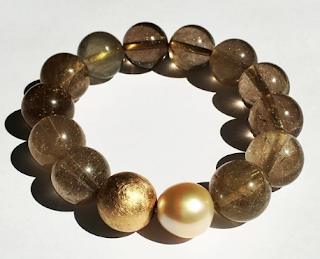 Yes to repurposing the smaller pearls as a multi-strand bracelet. That's what I did, and I really like having the bracelet for all-out evenings. On the other hand, I think we can wear smaller pearls IF we balance them with more substantial and interesting earrings. Indian chandeliers with seed pearls, or a cluster of pearls and semi-precious danglers. Large pearls on some of us do bring out the dowager, and it's not always a good thing. At 5'6" but getting smaller, I am wary of becoming a bantam in my old age. The single classic strand is so beautiful. I had no idea that was what debutant meant in French - now it all makes sense! I'll be curious to see what Duchesse says in response to LPC's comment. I asked LPC about this because I have a simple strand that might be as small as 5-6 mm (need to verify this) and I was wondering if I should give it to someone younger. She suggested ideas similar to those in her above comment. Thanks for the ideas about incorporating small pearls into a different design. Like Hostess says, I never tire of the pearl posts. Pearl size should be a function of age. For a young girl, a 6 mm single strand is adorable. We just purchased a 16 inch single strand of 6.5-7 mm pearls from Mikimoto with matching pearl stud earrings. They would make a great Christmas gift for a girl in her 20's. For a mature woman, small pearls just look a little to twee. I agree with LPC. Smaller 5-7 mm pearls make great multi strand bracelets. Even smaller pearls work well in a multi-strand torsade. 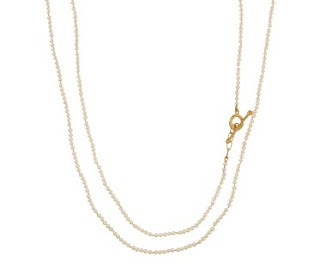 6.5 - 7.5 mm pearls will work well in a triple strand but for a single strand necklace for a woman of a certain age,it's 9 mm or bigger, in my opinion. I'm more than happy to go full dowager with 14-16 mm pearls! 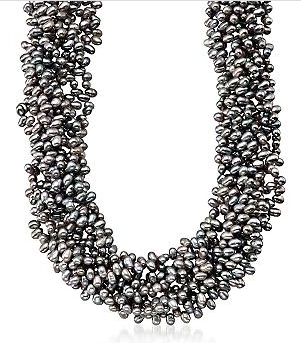 What I'm loving now is this negligee style necklace of diamond beads with two huge Tahitian pearls. It's the perfect mix of classic with edgy n'est-ce pas? this post prompted me to come out of hiding for advice. i love over the top jewelry. i'm in my -ahem- mid-40s and a petite 5'2". have been eying these 10-13 in beauties. is this too over the top? how reputable is ross-simon for high end goods? but the PP ones might be higher quality. Ross Simons are reputable and have a 30-day no risk return policy, so why not order and see? Look at them in natural daylight. Do they have overtones, the play of colour that seems to float over the pearl? Do the pearls have life? Try them on with a few different favourite tops. If you do not want to take them off, they are yours. I love this post! I'd never thought much about the size of pearls but it makes sense. Small pearls do seem rather girlish. I could see an exception if one wore a strand of small pearls with a group of larger ones, a la Mademoiselle Chanel. Hi Duchesse, we measured the strand and they're just over 6mm, so that puts them in your first category. I am going to restring them on a black string and replace the clasp with something interesting, maybe also add a pendant. 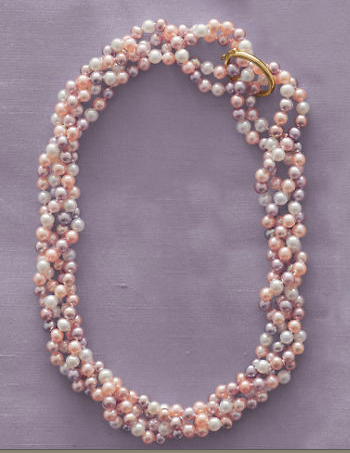 tweedlibrarian: Sure, you can mix small pearls in with larger strands but a 16 inch choker is still going to look lost, kind of like a too-small original window in a renovated house. I'd pull it apart and mix in some larger pearls, probably different colours b/c matching is very difficult. Susan Tiner: Small pearls used as the 'chain' for a pendant is a great way to restyle. Stringing small pearls on black thread is a more modern effect, though the small pearls, emphasized by the contrast b/t pearl and thread, look even smaller. I like the idea of an interesting clasp (and am always on the lookout for them.) Some jewelers make decorative clasps that act like a focal bead. I don't know where my first responses to comments went! So I am re-dong them. Pseu: You are right next door to the wonderful Zara Scoville of Priceless Imperfection. (She works in both gold and silver. I would love to have a piece of hers and it seems like your style, too. Gretchen: Wow, you have some pearls I'd love to see. 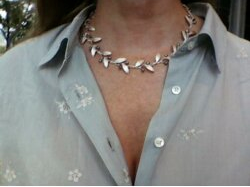 I usually don't wear pearl ER and necklace together either but have liked that on others. hostess: Another good way to wear them if one can still "fit into" a 16 inch strand- I cannot ;). LPC: There is a lot of territory b/t 6mm and really big pearls, yours to explore. Dowager never comes to mind with a string of funky baroques, but with perfect South Sea headlights, yes. My godmother did her laundry with a massive strand of Mikimotos hanging over the machine. sisty: Model knows what's what! Thank you. Bourbon & Pearls: Women who have a classic strand should take a hard look at size every decade. No reason not to size up now that a good 10mm strand is no more than a pair of Louboutins... well, maybe throw in a wellie. Belle: Madonna, that is gorgeous, thank you for putting this in my head... I think! Twee is the word I was searching for, that's it exactly. Insightful, informative post about how to buy and wear pearls! I have been occasionally thinking about restringing a strand of smaller pearls. When I was at my jewelers the other day, they were showing me some clasps for some banded agate beads which really intrigued me and now I am contemplating something similar for the pearls. I don't remember the name of the company, but it is German, and they drill into two (or three) beads or pearls to make either a hidden clasp using a bead, or there are several decorative bead-like clasps in silver or gold, with or without gemstones, that can function as a clasp and/or accent piece. Some of the options were very architectural and modern and I liked the idea of having a strong focal point which could also be changed if desired. Good article too. I'm tall and large myself, and I remember vividly the aunt I most look like - those tiny pearls and little chains made her look like a transvestite (nothing wrong with that, if you're trying for it..). I've definitely gone overboard with the size in reaction, and like it much better that way. I wear men's watches for instance. Thanks for pointing out pearls can be adult. 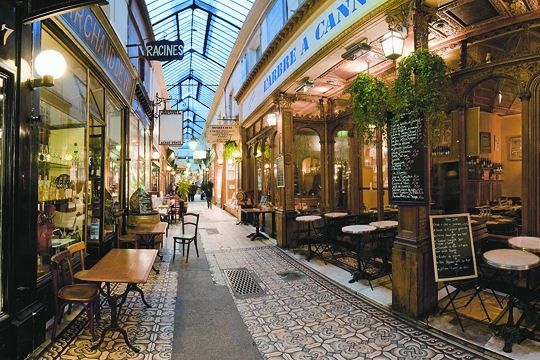 But I find it difficulty to buy any jewelry at all in France, where all women will be petite, whether they like it or not :-). You might also visit a jeweler like Lucile (31 bd Raspail, Paris) to have a longer or larger piece made; they have done so for me, and I am very happy. Love these illustrations, particularly of the different strand sizes on the same model.